Marx v Creevy: Which ironman blinks? Hoffman, back with a vengeance! 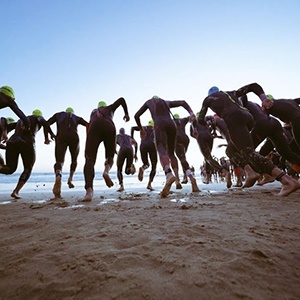 Cape Town - The African Ironman Championship event held in Port Elizabeth was hit with a double tragedy on Sunday as two competitors died in hospital after taking part in the swimming leg of the event. According to the Herald Live website, one swimmer suffered a heart attack while the other was struck by convulsions while swimming. The swim leg at the event, normally 3.8 km in length had already been shortened to 1.6 km because of extremely choppy conditions when the tragedy struck. Ironman South Africa released a statement confirming the deaths. "It is with great sadness that we confirm the death of two race participants at the IRONMAN African Championship. Both athletes required medical attention during the swim portion of Sunday’s race and were transported to a nearby hospital where they were treated. Our condolences go out to the family and friends of both athletes, whom we will continue to support. We are working with the local authorities to gather all details and will continue to do everything possible to provide a safe environment for our athletes. In respect of each family’s privacy, we will have no further comment at this time." The South African Police also confirmed that two competitors had passed away after they were taken to hospital.